Why a blog? I have actively avoided creating a blog as I have seen no need to add to the list of stuff that I need to do each week but I've decided it will be yet another way to reach my students. What will you see in this blog? I am the instructor for the Basics, Basics, Basics correspondence course offered by TKGA (The Knitting Guild Association). It is my policy that I review and send out lessons the day I get them. When I go out of town, this obviously doesn't happen. I like to give my students a heads up so they can plan accordingly. I update the materials ever so often and since I don't enforce a time limit for completion, I am more than happy to send out the updates. By they way, I've recently added the materials to my DropBox so it is very easy to send out links... and that includes students who have completed the course. When I add new courses (and I am working on two right now) I will announce it here. I am the advisor to the Master Hand Knitting Committee which certifies Master Knitters for TKGA. My brain is littered with tidbits on how to improve one's knitting and I think it would be helpful to start writing this down SOMEWHERE. The tip will usually include a video as well. To the right you will see the shortcut to the Tip of the Week. The blog will have the complete tip. I do design work for Cast On, the official publication of TKGA and I thought it might be interesting to record the design process here for anyone who wants to knit the designs when they are published. What will you NOT see in this blog? I consider my personal beliefs and the lives of my family members to be very private. I may periodically include things about the Knitting Salon that meets once a week at my house on either Saturday or Sunday depending on the schedules of the UK basketball team (I am not a fan but I am considerate to those who are) and the HD broadcasts of the Metropolitan Opera (I am a big fan). My cats, Petipa (named for the first choreographer of the Nutcracker ballet) and George Bernard Chat (named for George Bernard Shaw, the playwright) are fair game. What would a knitting blog be without the obligatory cat photos? Yes, I am a cliche. Have you ever wondered why most patterns suggest using smaller needles for ribbing? The reason why is that going down a size or two will produce tighter ribbing. Instead of reaching for your needle case, try this. When you are changing from a knit to a purl, bring the yarn forward VERY tightly. You might even want to give it a bit of a tug. If you don't do this, the excess yarn between the knit and the purl stitch either works its way back into the knit stitch making it big and sloppy or it forms a "ladder" between the stitches. Neither is very attractive. Compare the two swatches in the photo to see the difference this can make. When you use smaller needles, the amount of yarn is reduced between the stitches which makes it look much neater. This tip also works for seed stitch and cables as well. Give it a try! Here's the video. I'm working on things for the Summer 2012 issue of Cast On. I'm doing a skirt and shell set knit in Louet Euroflax. Things haven't gone exactly as planned. I was originally going to use a single strand. After working a gauge swatch I discovered to my horror that it would be completely see through (not such a great idea for a skirt) if I did not use Size 2 (!!!) needles. I rethought the design and tried using two strands together. MUCH BETTER. The bottom of the skirt will have a crossed stitch pattern. The skirt is now blocking and I am working on the shell. It's great that you have started this blog, Arenda - will be helpful, I'm sure, to all who are working on the MHK program, as well as those who have started Basics. I love seeing what you are working on for an upcoming issue of Cast On. Vương Lâm nhướn mày, lạnh lùng nhìn Đỗ Kiến, chậm rãi nâng tay phải lên, định bắt lấy y ném ra miệng khe. - Ta thấy sư tôn nuốt lấy Tôn Vân ! Vương Lâm ánh mắt lóe lên mạnh mẽ, nhìn chằm chằm Đỗ Kiến, không nói lời nào. - Không phải ta tận mắt nhìn thấy, mà là một Sơn Tinh nhìn thấy. Sau khi ta vào Thiên Vận Tông, tu luyện một công pháp có thể hấp thu linh lực từ một vài Kỳ Thú. Tại hậu sơn ta vô tình phát hiện ra một Sơn Tinh tuổi thọ sắp hết, khi ta hấp thu linh lực của nó, không biết vì sao lại bất ngờ rút ra được một ít ký ức của Sơn Tinh. Trong trí nhớ của nó, từ rất lâu trước có một hình ảnh, đó là sư tôn nuốt lấy Tôn Vân ! Tâm thần Vương Lâm chấn động. 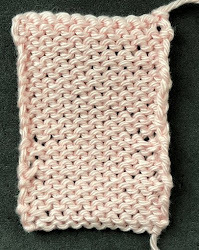 Thanks for the blog Arenda - I viewed the video on changing from knit to purl and tightening up on the purl stitch. I am going to go and try it right now and see if I can avoid the ladder and/or the messy left stitch. love this blog already & I can't wait until I get started on my Masters Knitter classes. Another good blog. You're a good and useful engine (Thomas the Tank). In reference to the Vlad that photogrpahs bad, when that happens, send the file to be and I can color adjust.